The Palais Galliera: Musée de la mode de la Ville de Paris is a French museum dedicated to fashion and textiles. Located in the 16th arrondissement of Paris, it has a collection of over 90 000 objects dating from the 18th century to the present day, with a focus on high-end and aristocratic clothing. I was lucky enough to undertake an eight-week placement with the conservation team at the Palais Galliera last summer as part of my MPhil in Textile Conservation at the University of Glasgow. 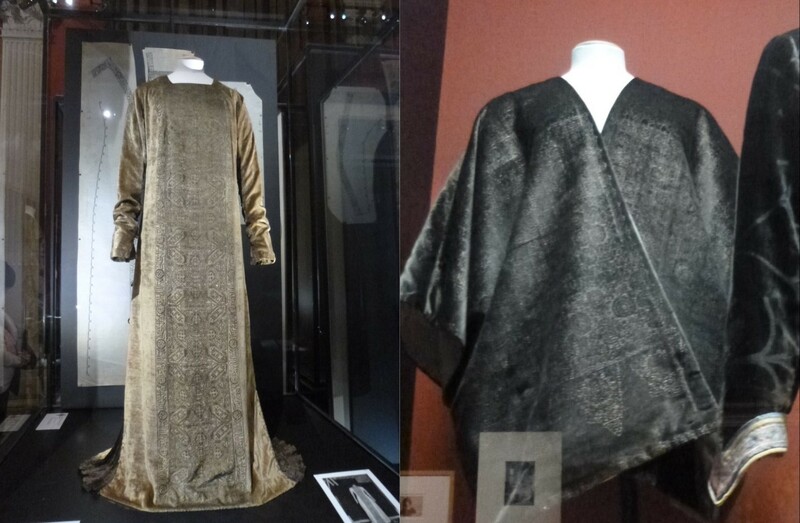 Over the duration of my placement I worked on two exciting objects for the recent exhibition ‘Fortuny, a Spaniard in Venice’, which covered the work of the early 20th century fashion designer Mariano Fortuny. The first was a silk velvet evening jacket and the second an ‘Eleonora’ dress. The overall objective of my work was to consolidate areas of weakness to enable these objects to be mounted on mannequins for the duration of the exhibition. Without remedial treatment weak areas such as tears will worsen with display on a mannequin. Moreover, the mounting process requires several ‘fittings’ to ensure that the mount has been built up to support the costume adequately. 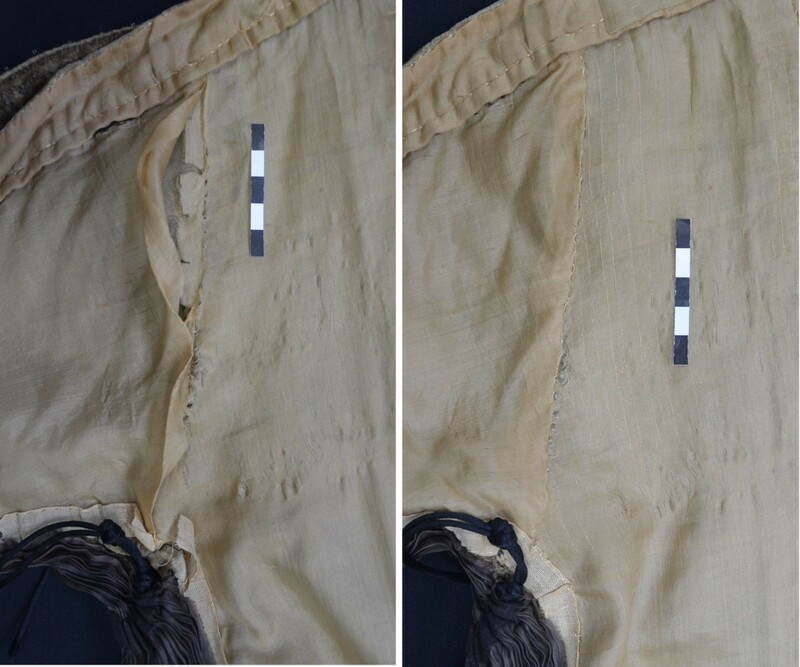 This means that costume often undergoes more manipulation and handling than two dimensional textiles, factors which must be taken into account during conservation. 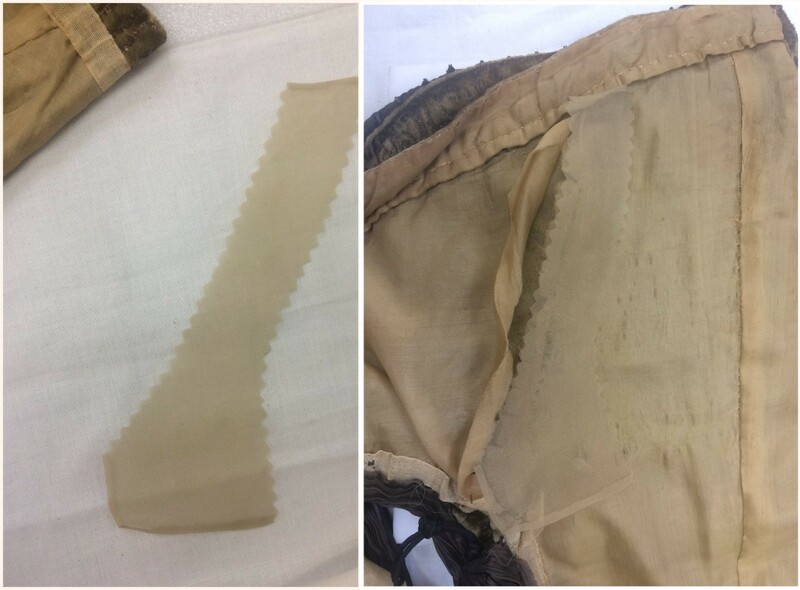 One of the most frequent methods for consolidating weak textiles is a stitched support. This involves attaching the degraded area of a textile to a new backing fabric with rows of laid couching. Using a curved needle and keeping the object completely flat with the support fabric behind, a single thread is drawn up over the weak area and stitched in place. The backing fabric provides structural support and the new threads provide consolidation. (1) As well as providing support, conservators must choose materials which match the original fabric in terms of colour, drape, sheerness and response to environmental conditions. The objects I worked on required a number of stitched supports, providing an excellent opportunity for me to expand my understanding of this treatment. Fortuny is famous for his very finely pleated silk dresses. (3) The ‘Eleonora’ dress has vertical strips of pleated fabric running the full length of each side. On the dress I conserved the pleated silk had been attacked by insects resulting in numerous small holes. Several of these were substantial and there was concern that these might worsen during mounting. The challenge was to create a suitable stitched support which would accommodate the pleats without causing them to open out. For this I used silk crepeline, a light transparent fabric which would provide support without being too visually disruptive. With the help of my supervisor, I cut small squares of crepeline. These were then moistened, folded manually several times, pinned and left to dry out. Afterwards, I gently pulled out the pleated silk of the dress and pinned the support to the back, pinning into the recess of each pleat. Finally, I quickly couched the support in place from the front. I thoroughly enjoyed learning how to conserve these objects and would like to thank my supervisor, Sylvie Brun, senior textile conservator at the Palais Galliera, for all of her help and encouragement during my placement. 1. Mechthild Flury-Lemberg “Conservation with Needle and Thread,” in Changing Views of Textile Conservation, ed. Mary M. Brooks and Dinah D. Eastop, 168 (Los Angeles: Getty Conservation Institute: 2011). 2. Foekje Boersma, Unravelling Textiles: A Handbook for the preservation of textile collections, (London: Archetype, 2013), 25. 3. Guillermo de Osmo, Mariano Fotuny: His Life and Work, (London: Aurum Press, 1980), 86. 1. Boersma, Foekje. Unravelling Textiles: A Handbook for the preservation of textile collections. London: Archetype, 2013. 2. Flury-Lemberg, Mechthild. “Conservation with Needle and Thread.” In Changing Views of Textile Conservation, ed. Mary M. Brooks and Dinah D. Eastop, 168-174. Los Angeles: Getty Conservation Institute: 2011. 3. de Osmo, Guillermo. Mariano Fotuny: His Life and Work. London: Aurum Press, 1980.